What happens to the garbage after it leaves the curb? Young children will enjoy finding out in this book, part of a first reader series that introduces them to the important jobs done by community workers. 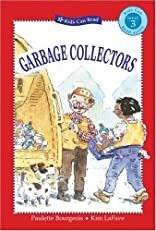 Facts blend seamlessly into the story, which provides a behind-the-scenes look at a day in the life of garbage collectors. Garbage Collectors features recycling information and tips on how kids can reduce the amount of garbage they throw away. These fun and informative Level 3 first readers are based on the picture books of the same name.